Kindle Fire vs Samsung Galaxy Tab 2: Which Should You Buy? There are loads of new 7” tablets coming out lately that have their eyes on the Kindle Fire’s success. The common theme seems to be having either slightly higher specs and a few of the features that people complain the Kindle Fire lacks, or a lower price point that doesn’t preclude basically functioning in the ways that matter. As I’ve mentioned numerous times here, companies who are looking at just the hardware or just the price and picking these out as roads to success are missing the point. Samsung’s first attempt at a 7” tablet was not precisely groundbreaking. For a smaller device, the Galaxy Tab was impressive and did practically anything you might want a tablet to do. It packed more power and features into that small package than any other Android tablet I can think of to come out in 2010. Still, as a device intended to compete with the iPad, it didn’t take off. Later, with the Kindle Fire announced, it became practically irrelevant. Nobody is going to want to consider a tablet running twice the price of the most popular thing around unless it is truly amazing. Now Samsung is coming out with the more realistically competitive 7” Galaxy Tab 2 and there’s reason to give it serious thought as a choice. It isn’t amazing, but at $250 it also isn’t overpriced and the value is impressively high for what you pay. 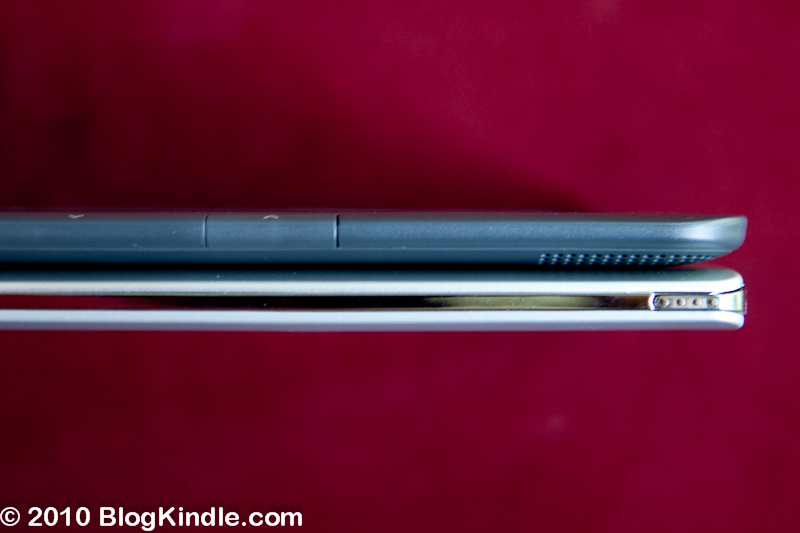 The new Galaxy Tab 2 is slightly thinner and lighter than the Kindle Fire. We’re not talking about the most powerful tablet on the market, with a 1GHz processor and 1GB of RAM, but it should do the job. It comes with 8GB internal storage as well as an expandable memory slot that can allow for an extra 32GB. As a perk, new users will get a free year of 50GB Dropbox storage. There are dual cameras, though the front-facing is mediocre at best and even the rear-facing isn’t anything to get excited about. 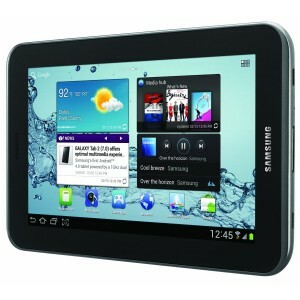 The Galaxy Tab 2 does run Ice Cream Sandwich (Android 4.0.3) and is the first Samsung offering to do so, which may be a draw for some. Overall, we’re talking about something that beats the Kindle Fire point for point across the board in hardware specs. That isn’t exactly exciting on its own, given that the Kindle Fire was never intended to impress in terms of raw power, but the fact that there aren’t really any missing features besides perhaps an HDMI slot is worth keeping in mind. The screen is actually somewhat less clear than the Kindle’s, but not enough to get upset about. The consideration is going to come down to hardware versus software and media. 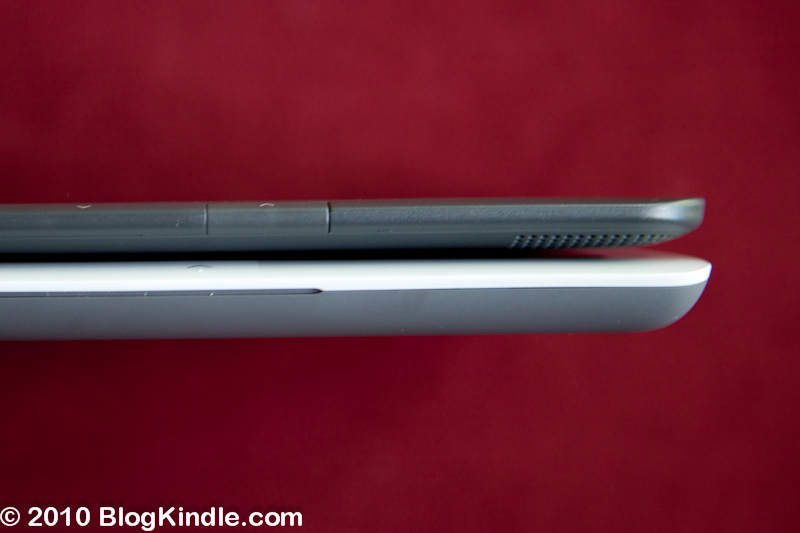 If we’re going to talk about a Kindle Fire vs Galaxy Tab 2 comparison, we have to consider the overall experience. The Kindle Fire, in addition to featuring a $200 price tag, a heavily streamlined UI, and integration with Amazon’s digital services, can take advantage of the Amazon.com movie library and the Kindle Owners’ Lending Library in a way that the Samsung tablet can’t. Amazon has also proven more reliable about their firmware updates than Samsung, whose older customers still have not been able to upgrade to Android 4.0. 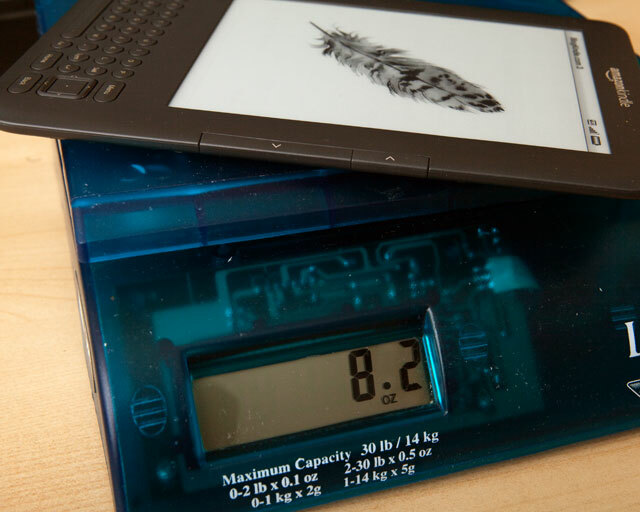 If these conveniences don’t weigh you toward the Kindle Fire then a 7” Galaxy Tab 2 might be exactly what you’re looking for. 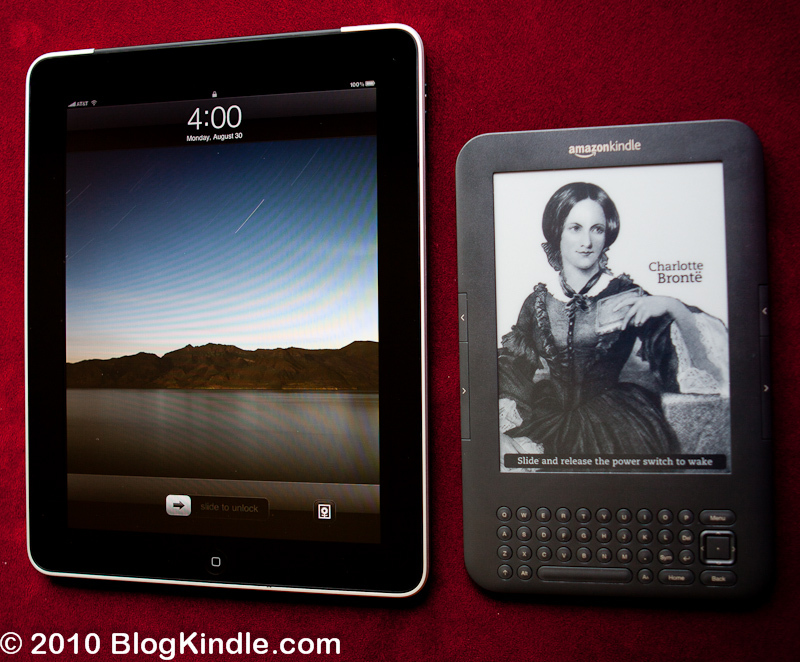 Kindle Fire vs iPad 3 Is Easy, But Will Kindle Fire 2 Change Things? I’ve gone over the fact that choosing a Kindle Fire or iPad isn’t really a tough decision before. They are completely different devices that offer drastically different capabilities to their users. A Kindle Fire could no more replace everything an iPad does than it could a traditional Desktop PC, but buying an iPad to do nothing more than what the Kindle Fire is capable of is wasteful at best. There is some speculation that this will be changing in the fairly near future, however, and we have to wonder how well Amazon can hope to pull off a direct confrontation. Their strength has been the ability to present a device that does exactly what it sets out to do, does it well, and doesn’t claim to be able to do anything more. The Kindle eReader can be adapted to type on if a user feels like it, but Amazon never advertises it as a tool for that. The Kindle Fire was provided with just enough power to handle movie watching and most common apps. To be able to compete with an iPad on Apple’s terms, Amazon would have to be prepared for just about anything a user would want to do. Some of these things are easy. Cameras, which most people are either convinced or at least hopeful that the Kindle Fire 2 will have, would go a long way toward making it a better communications device. A mic, which obviously would be needed in almost any situation where a camera would be useful, would also allow for voice controls and speech-to-text. The larger screen would offer users greater real estate for customizing their experience and developers more leeway to add in features or information in ways that couldn’t fit on a smaller device. To really match the iPad 3 side by side though, they would need more. It is pretty safe to say that the Kindle Fire 2 will not have a Retina Display. It will also not have multi-touch capabilities able to handle significantly more than two contact points at a time. The screen will be larger, which is useful, but the impact of that can’t be assumed to cover everything. In terms of processing power, graphics capabilities, and any number of other factors, there is little reason to believe that Amazon has a chance at taking the lead in general use situations. Does this mean that a larger Kindle Fire will flop? I don’t believe so. If Amazon can keep the price down, it will still stand out. Apple’s keeping the iPad 2 available at $400 is ingenious in that it makes the comparison with a 9-10” competitor at $300-350 closer than it would be otherwise, but that doesn’t mean there isn’t room to move in. Really the only question will be how much they advertise what the new Kindle Fire is meant to do. If they can make it clear that despite being larger it is still a purely consumption drive design, that will work as an advantage. If they seem to be actively trying to create and sell a full featured tablet, it will take something big. Early on in the Kindle’s life, there was a lot of insistance than it couldn’t possibly succeed as a product when there was something as great as the iPad available. As we know, these predictions of doom didn’t exactly pan out. Dedicated eReader products were able to carve out their own market by bringing along capabilities that made them exceptional at what they did, even if that one task was somewhat narrow compared to potential competing types of products. 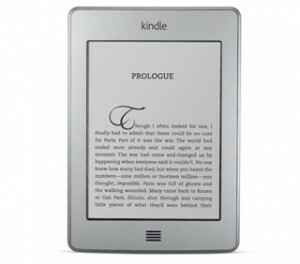 With the recent announcement of greater variety in the Kindle line, however, there is likely to be at least a small amount of confusion among prospective buyers. After all, Amazon has made a great eReader line and many will want to force the Kindle Fire into that niche despite its better fit elsewhere. While it makes sense for Amazon to want to capitalize on the popularity of the Kindle line by including the new tablet in it, it remains important for people to realize the things that the Kindle Touch will do better as a reading device. In order to help simplify things, let’s look at some ideal uses are for each specific device. As you might expect, the actual eReader is a bit more focused on the book experience while the Kindle Fire is able to handle many tasks. At first glance, this implies that the tablet is the more valuable tool. For many people this may well be the case. Just as the iPad does more than the Kindle in terms of sheer feature quantity, the Fire will always come out on top in that way. This should not be mistaken for an indication that the Kindle Touch is never the superior device, though. No matter what advancements become possible with LCD technology, it is unlikely that these displays will be able to match the ease of use provided by the E INK Pearl. 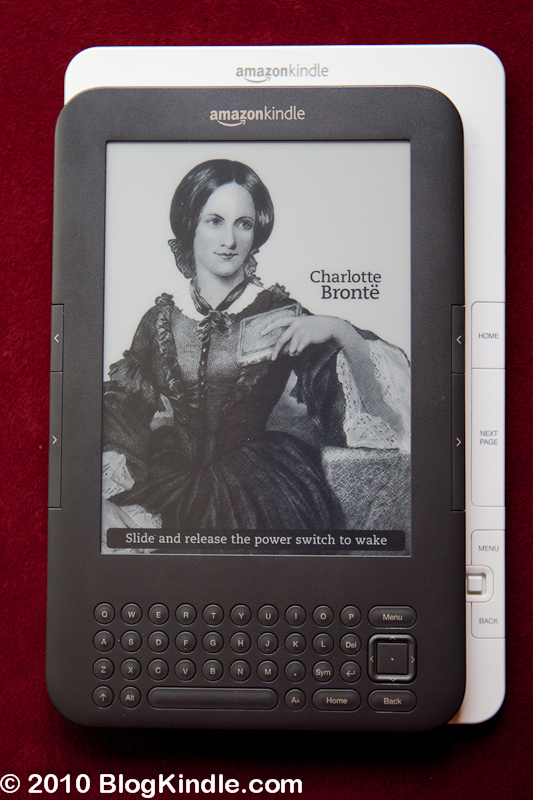 While some will claim that they have no trouble with reading on a backlit screen, the vast majority have expressed a definite preference for something like the Kindle Touch during the long periods of reading likely to be taking place over the course of a novel. These displays are also handle sunlight quite a bit better if that happens to be your preference while reading. In addition to the screens, when you’re reading a book it is nice to be able to put it down and pick it up again a day or two later without worrying about charging. The fact that Kindle eReaders last weeks to months between charges makes them feel more like read books. The weight is also less than half that of the Kindle Fire, which while not necessarily a major issue at first will be noticeable over long periods of on-handed reading. Perhaps the biggest selling point for the active reader will be the X-Ray feature. Amazon promises that this will be a great aid for picking out important passages, accessing related material, and generally supplementing your reading experience. While it is not something that we have been able to preview at this time, a system that works as well as Amazon claims X-Ray will would be an invaluable tool for many reasons. If reading isn’t your main concern, of course, then the Kindle Fire still makes a lot of sense. The 8 hour battery life is at the high end for similar products, the app store is one of the best, and the whole end to end experience is geared to make viewing, listening, browsing, and reading as comfortable as possible. At $199, this is a game changing device that packs far more power and functionality than you would expect into a compact package. To go along with the launch, Amazon has beefed up their Instant Video collection with tens of thousands of new titles including many available for free to Amazon Prime subscribers. They have put a lot of work into making sure that streaming video runs smoothly on the new tablet, so it is safe to say the experience there will be as pleasant as possible on a 7″ screen. I would not recommend the Kindle Fire for readers, due to screen type and battery life especially, but other than that it will be a valuable resource to just about anybody. It’s portable, light, fairly powerful, and capable of opening just about any form of media you can think of. While nobody is really expecting that the iPad is in any trouble from this corner at the moment, it’s hard to argue with something that does a comparable job at less than half the price with what may be an even better source of content to draw on. 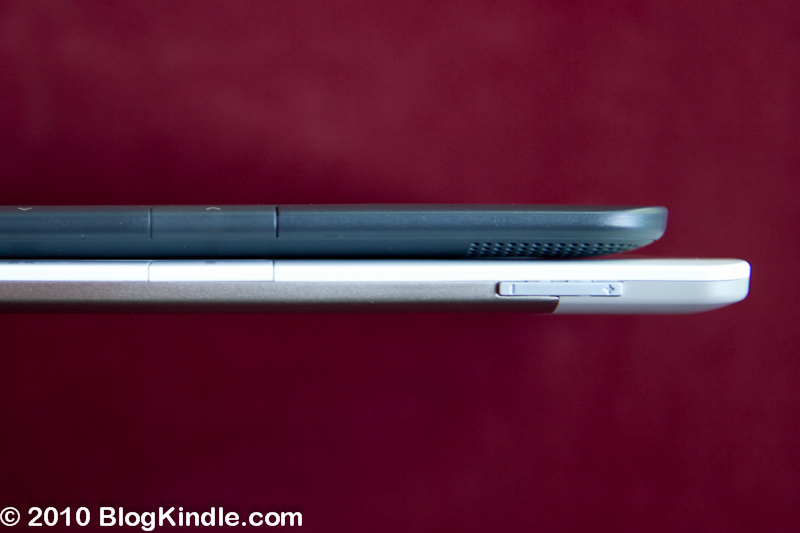 Kindle Touch vs Kindle Keyboard: Is It Worth An Upgrade? Some of the longest running customer demands for the Kindle line have been a touchscreen, a color display, and a price under $100. The Kindle Touch and Kindle Fire each manage a different combination of two out of those three. The big question now is what this means for Kindle owners. 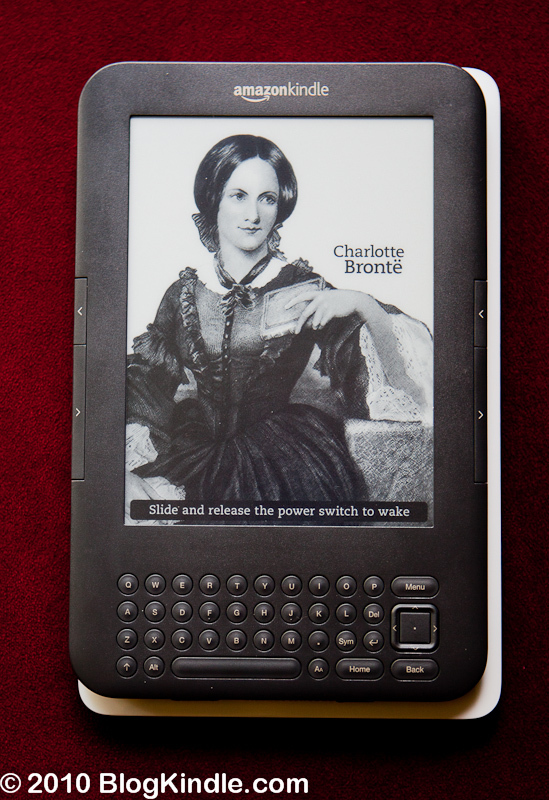 Is the addition of these features worth the cost of purchasing a new eReader, even as cheap as they’ve become? For that matter, should people just now coming to the eReader experience jump on the newer Kindle Touch or the Kindle Keyboard being sold for the same price? Not quite as much as one might think, really. The real differences that come in stem from software improvements. As you might notice in the table above, though the two Kindles share the same storage space measurement they have different listed book capacities. This is because there are a couple things going on in the Kindle Touch software that the Kindle Keyboard does not have access to, which decreases the available area of the device’s storage a bit. The less significant, though still quite useful given the interface, is the EasyReach system. This partitions off the touchscreen so that the majority of the screen can be tapped for paging forward while the leftmost edge of the screen will work as a backward page turning button. This eliminates the need for finger swiping. Swiping was certainly a fine idea and emulates the page turning experience found in a paper book to a certain extent, but it gets old after a few hundred pages as anybody who wore out their original Nook can likely attest to. More importantly, the Kindle Touch will be coming with something called X-Ray. The X-Ray feature is basically intended to be an intelligent extension of the search function, based on Amazon’s description. Not only will it find instances of word use, though, it will supposedly find all instances of a character, idea, place, or topic throughout as well as linking to relevant articles on either Wikipedia or Amazon’s own Shelfari service. How successful this feature is remains to be seen, but Amazon clearly places a lot of confidence in it and emphasizes their own expertise in machine learning and data processing in explaining how they can make such a bold claim. The product page literally says that “The vision is to have every important phrase in every book.” An intriguing, if highly ambitious claim. The benefits of a Kindle Keyboard are a bit more modest. Aside from it being a proven device with very few shortcomings attached to it at this point, you also get physical buttons, more application/game options, and a slightly different experience in 3G usage. The keyboard isn’t the most wonderful thing in the world, but it does the job. This will be a benefit for anybody who prefers feedback on their button pressing. It also means that more of the games and other applications currently available will work for you. For the most part developers have been able to assume the presence of these controls up until this point and it is unlikely that many will be able to adapt to a touchscreen display. This is not to say that there won’t be plenty of games and such that exclusively use the touchscreen in the future, but for now Kindle Keyboard owners have a clear advantage when it comes to non-reading eReader usage. The 3G coverage that I mentioned is also noticeably more useful than that on the Kindle Touch. 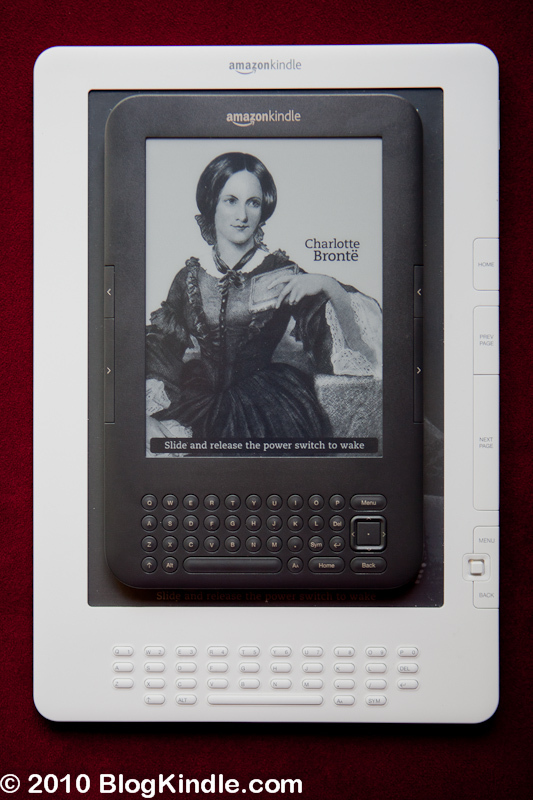 Unlike the newer device, the Kindle Keyboard remains able to access the entirety of the internet through this connection (albeit in a sub-par browser), while the new Kindle will be restricted to the Kindle Store and Wikipedia. Anything more is going to require access to a WiFi network, in which situations you will generally be able to access a more internet friendly device anyway. Of course, I am personally taking this as a sign that the Kindle Keyboard is either going to be phased out in the near future or blocked off in a fashion similar to the Kindle Touch, but it is safe to say that current owners and near-future adopters will not be affected. When it comes right down to it, there isn’t enough difference between these two to really justify an upgrade. If you own a Kindle Keyboard already and have no particular attachments to touchscreens or potentially super-smart text searches, you shouldn’t feel too bad about waiting a while before getting another eReader. If you’re new to the whole eReader scene, I would probably recommend the $99 Kindle Touch. It is the newest and most likely to be supported in the long term, especially in terms of firmware updates. In addition, you get the touchscreen interface which is certain to be a bit more versatile for most users when compared to the directional control on other Kindles. Completely worth it considering both devices are the same price anyway. With Kindle 4 being released, some people on forums started arguing whether Pearl eInk screen is the same in $99 Kindle Keyboard and $79 Kindle 4 “Non-Touch”. Both sides have posted side-by-side photos to support their claims. Having recently obtained a Spyder 3 Print SR colorimeter for purposes of calibrating my printer I decided to do my own research. Telling whether two colors are the same or not is a tricky business. Lighting, our eyes and brain can play tricks on us that can be best illustrated by this short video. Different colors may appear the same under different lighting conditions or if they are positioned in a certain way. The opposite can also be true. The biggest factor is the context – what is around objects that we try to color-match. It can make things appear darker or lighter or even change tint. This is where precision colorimeters come in. Precision colorimeter is a device that contains calibrated light source and calibrated color sensor that measures color of a very small spot on an object. This eliminates effects of external lighting and takes our eyes out of the equation. It produces 3 numbers “L”, “a” and “b” that precisely identify a color regardless of its origin or context. “L” stands for lightness. It measures how bright the color is. This is what one would care the most when evaluating grayscale device such as Kindle. “a” and “b” contain information about color – whether it is green or blue. Ideal neutral gray color has both “a” and “b” equal zero. In the past I did some very crude measurements to compare Kindle 2 and Kindle 3 with my DSLR by trying to keep lighting consistent across exposures. This time I used the Spyder colorimeter to compare Kindle 4 and Kindle 3. 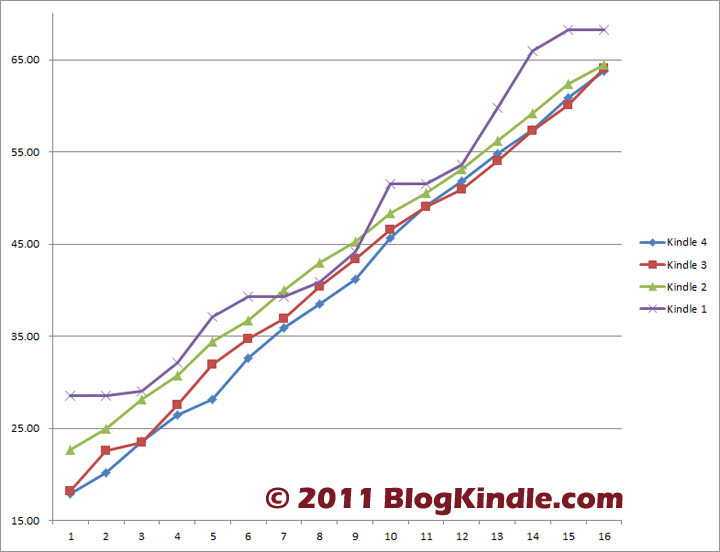 I also threw Kindle 2 and Kindle 1 I had in the mix to gather more data and validate my DSLR measurements. I created 16 PNG files that contain monotonous squares ranging from #000000 to #ffffff with #111111 as a step. I copied these files on Kindle devices and measured each square with colorimeter. To make results consistent I refreshed the screen by pressing Alt-G before each measurement (Keyboard+Back on Kindle 4). If I weren’t lazy I would measure each color multiple times and average out the results. However after some testing I found little variation in measurements of the same color so I let it slide. Below is the table with measurement results and a graph to illustrate it. As you can see, Kindle 3 and Kindle 4 have very similar response curves and dynamic ranges, even despite the fact that I’ve heavily used my Kindle 3 (Keyboard) during the last year, while Kindle 4 is brand new. Perhaps if I had a specimen of unused Kindle Keyboard, measurements would be even closer. 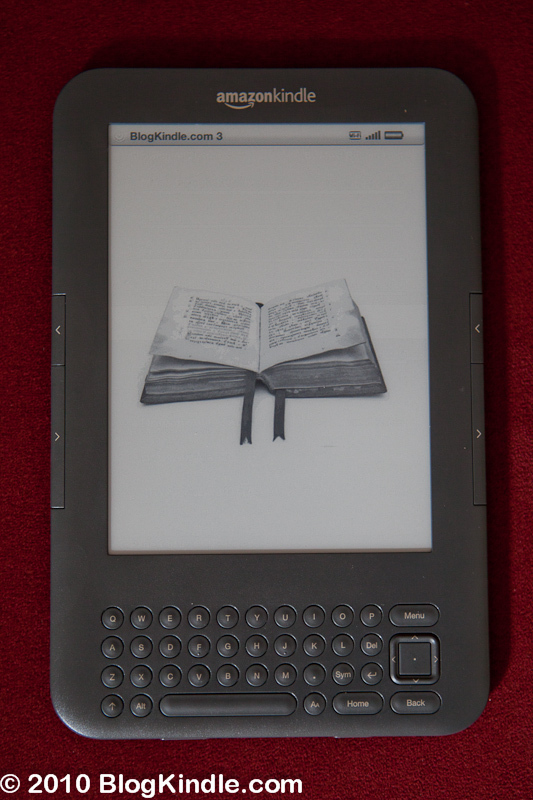 On the other hand measurements of Kindle 2 and Kindle 1 are very different from K3/K4. According to Amazon these devices use different screen technology and it shows. These results are also very much in line with my rough DSLR measurements from last year. Kindle 1 supports only 8 shades or gray (as opposed to 16 in later models) and it can be seen in a non-linear character or its transfer curve. 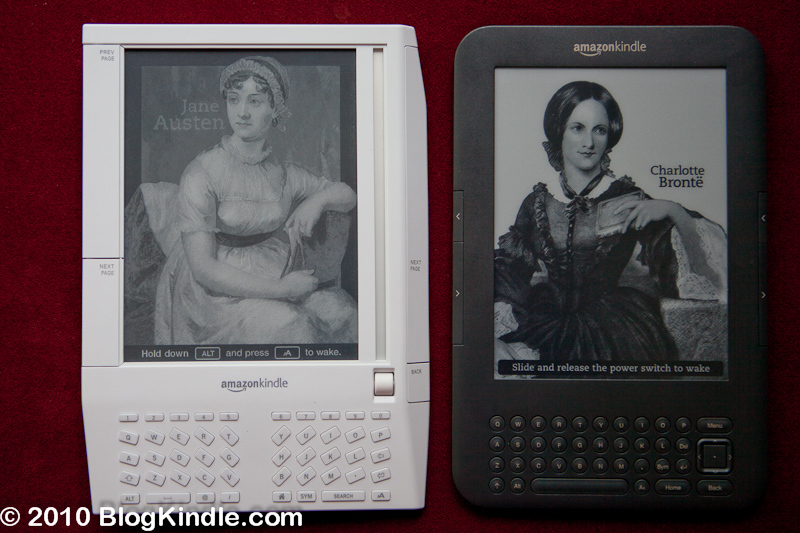 Bottom line: Kindle 4 and Kindle 3 have very similar screens to the point of being identical. While point is the same in Kindle 2 and Kindle 3/4, but Kindle 2 has lighter darks. Kindle 1 has lighter whites but also even lighter darks than Kindle 2. I am unable to really express how often over the last year or two I have heard from people the idea that the Kindle will never hit it big until they get their pricing under the hundred dollar mark. This has not stopped the Kindle from becoming overwhelmingly popular, but it makes a great talking point for people who want to argue for discounts or claim Tablet PC superiority in eReading. Finally, however, we can have an end to the idea’s repetition. There is now a Refurbished Kindle available for just $99. There are other factors involved that might make this a deal worth waiting on, though. The $99 pricing seems appealing and probably will sway a few people. I seem to recall that discounted refurbs toward the end of the Kindle 2’s life cycle did the same. Still, before you jump on it, it is important to keep in mind what this move is likely to imply. Rumors abound, both substantial and completely speculative, about the upcoming next generation of Kindle products. We can be almost 100% sure that they will be showing up in the next three months, but beyond that there is little total certainty due to the expected overlapping release of the first Kindle Tablet and the difficulties inherent in trying to pick through the bits of information we have to determine which bit goes to which device. Given competition in the eReader marketplace alongside some business moves that Amazon has made lately, though, we can make some pretty solid assumptions. Amazon will, it can be assumed, be releasing a new touchscreen Kindle. It is very, very likely that it will run Android in some form. There are certain to be several incarnations of it to allow for choice between WiFi, 3G, ad support, and the combinations thereof that we have become accustomed to. It is very unlikely that the new Kindle baseline model will cost more than the $114 currently being asked for the cheapest brand new Kindle on sale right this minute. The question potential customers have to ask, then, is what factors matter in their choice. If this is meant to show Amazon that you will not support Kindles over $100, then it is a good way to put your money into making your point while still getting a great product. If you are in a hurry and don’t feel like waiting to get the new Kindle, then it makes sense to pick up one of these. Never any harm in grabbing a refurbished product from a company that is known to have excellent customer service. If you don’t have a point to make and aren’t in a rush, however, I can’t see that holding back to see how well the Kindle 4/Kindle Touch/Kindle Whatevertheycallit stacks up compared to the competition. There’s no reason to believe that there won’t still be Kindle 3 refurbs and back stock sitting around by then anyway, probably discounted even further or sold through Woot.com. While there are rumors going around that many customers will be getting brand new Kindles labeled as refurbished in order to be sneaky about their official new product announcement, it is hard to see Amazon running out completely in the next couple weeks. As somebody who both loves having a Kindle and who is proud of his fairly extensive physical library, it can be infuriating to hear people talk about their perception that eReaders stand in opposition to books. I will certainly acknowledge that there is a completely different tactile experience that you get when reading a printed book. I’m not even going to try to make the claim that it isn’t superior to that of the eReader, since that’s obviously a matter of personal preference rather than objective evaluation. What I promote, however, is the idea that while it may be important in some cases, as a general rule the medium through which a text comes to you should always be secondary to the text itself. When I buy a book, speaking solely for myself, I buy it because I want something to read. When there’s something I particularly like, or when there’s an edition that adds something that can’t be found elsewhere, I grab a copy for the bookshelf. This keeps it available, visible, easily referenced, and has a certain aesthetically pleasing effect. In no situation that I can think of, however, would I grab a book that I have no interest in reading. What would be the point? Now, assuming you’re still with me to this point, it only stands to reason that eReaders like the Kindle make a book-lover’s life a little easier. Even if you leave aside the issue of bulk and transportation when it comes to a paper book, there’s a big advantage to having books available electronically. Availability. An eBook never runs out at the local store, never goes out of print, and theoretically will never wear out. While there is a certain nostalgia in picking up a well-loved old book that is just coming apart at the seams, I’d rather than a copy that is as readable the tenth time as it was the first. And if I want to go back and read the author’s earlier works because I liked it so much, I don’t want to have to worry about the book being out of print or on weeks of back-order at the local book store. In either of those cases, I’d be more likely to put the idea of reading what I want aside because it would be more hassle than enjoyment. Thanks to the Kindle, no worries. It should go without saying that this only serves to enhance the existing system rather than detract from it. There will always be situations where you want a paper copy, whether it is to fill a book shelf, doodle in the margins, run a highlighter over, or what have you. In the end, however, it’s better to have the text available. That is the primary concern on which everything else rests, and the service that the Kindle provides. One way or another, if an eBook has existed then it is highly unlikely that it will fail to be available should you need it. This cannot be a bad thing, when what you truly care about is experiencing the text of a book. Picture is worth a thousand words so rather than writing one more Kindle 3 Review (which I encourage you to read if you haven’t already), today I decided to publish several Kindle 3 photos. Personally I’m a huge eReader fan and gadget geek as you can see from my pile of eInk hardware. 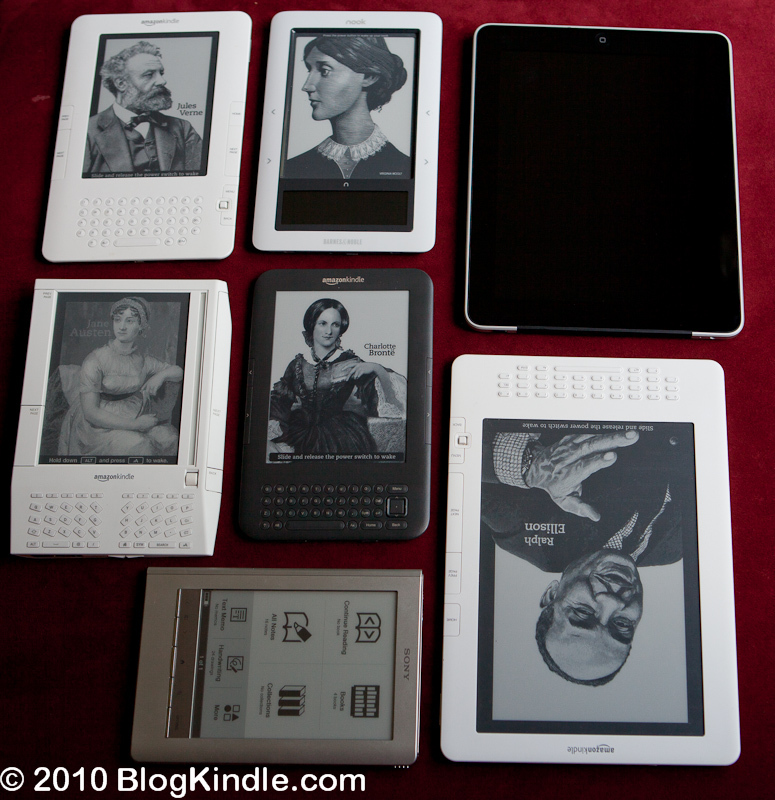 Out of all devices Kindles get the most use: 6″ devices to read books and Kindle DX to read newspapers and magazines. iPad is also used quite a bit but mostly not as eBook reader. Kindle 3 frontal shot. Kindle has a picture viewer easter egg. In order to use it: create “pictures” folder in the root directory of the Kindle USB drive, create some sub-directory there and fill it with pictures. Once in home screen, press Alt-Z to make Kindle 3 rescan picture folders. Subfolders of “pictures” folder that have JPEG, GIF, PNG or BMP files in them will be visible as books and images will become pages. It may be a nice way to enjoy manga on your Kindle 3. 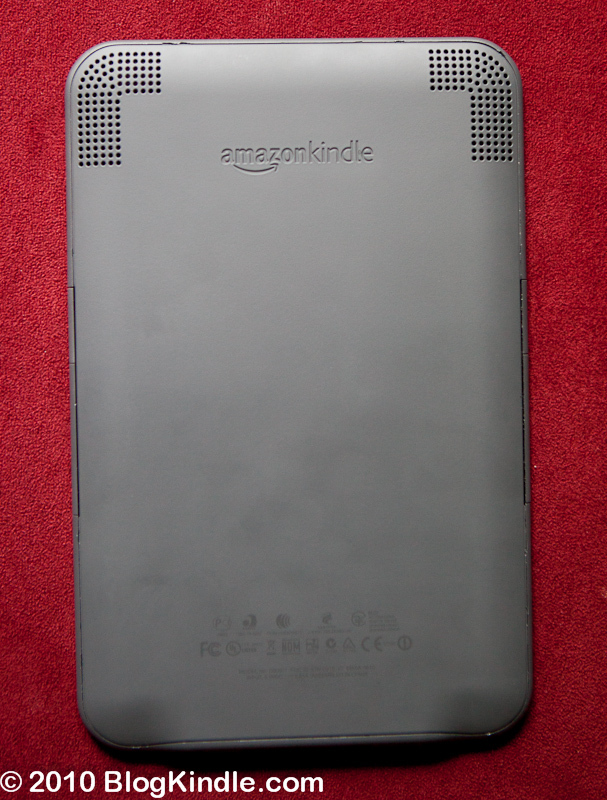 Kindle 3 back cover has a nice rubbery feel to it that makes the device very comfortable to hold. I has Amazon Kindle logo embossed in it. If you look closely at the slit between front and back covers you will be able to see screwdriver marks from my Kindle 3 disassembly attempt. 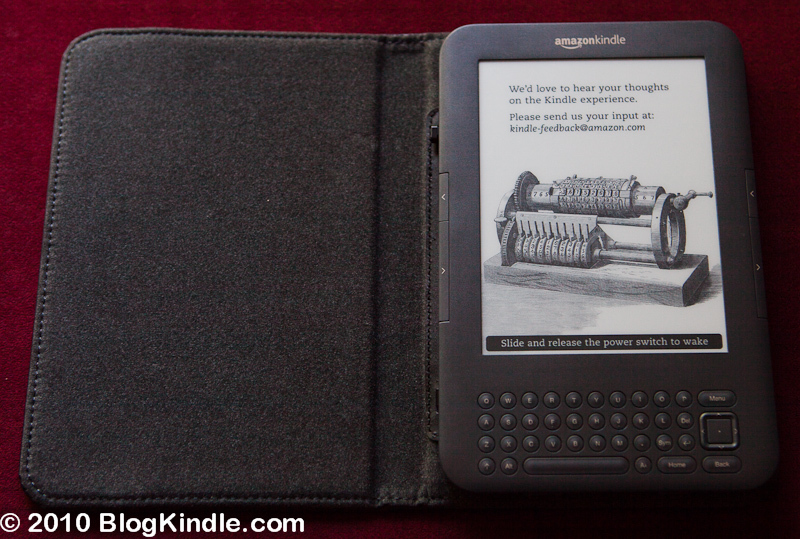 For some reason Amazon (NASDAQ:AMZN) has overstated Kindle 3 weight. It really weights around 8.2 ounces as opposed to the official spec of 8.7 as confirmed by multiple sources. 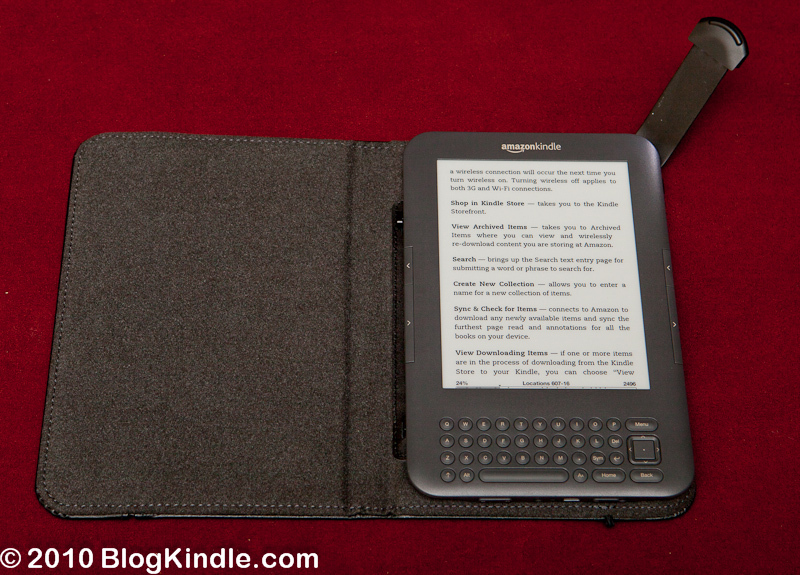 One of the standard Kindle 3 accessories that Amazon sells separately is Kindle 3 Leather Lighted Cover. It is intended to protect your Kindle from scratches and falls. Although I’ve never field-tested it, judging by it’s solid construction it should do a good job. 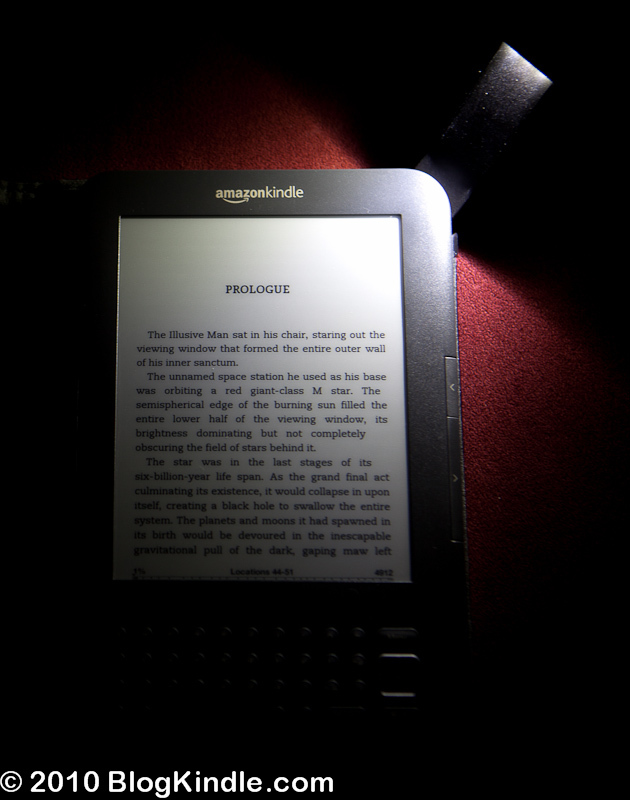 It also has a built-in LED light for night reading that draws power from Kindle battery via conductive cover hinges. The downside is that the cover doubles the weight of the device. As you can see, page lighting is not completely even. However from my personal experience I can tell that the cover is completely usable for reading at night. DSLR cameras tend to exaggerate contrast. When not in use the light slides into the cover and stays completely hidden. There is also leather cover without built in light that costs less and is couple of ounces lighter. Amazon designers have moved all buttons (except for paging) and connectors to the bottom edge of the device. From left to right you see volume control (for two built-in 1W stereo speaker or headphones used for “Read To Me” text-to-speech feature, listening audiobooks or DRM-free MP3 files), stereo mini-jack headphone connector, microphone (that is not used for anything right now according to the user’s guide), standard micro-USB PC/charging connector, power switch with integrated large charging LED light. 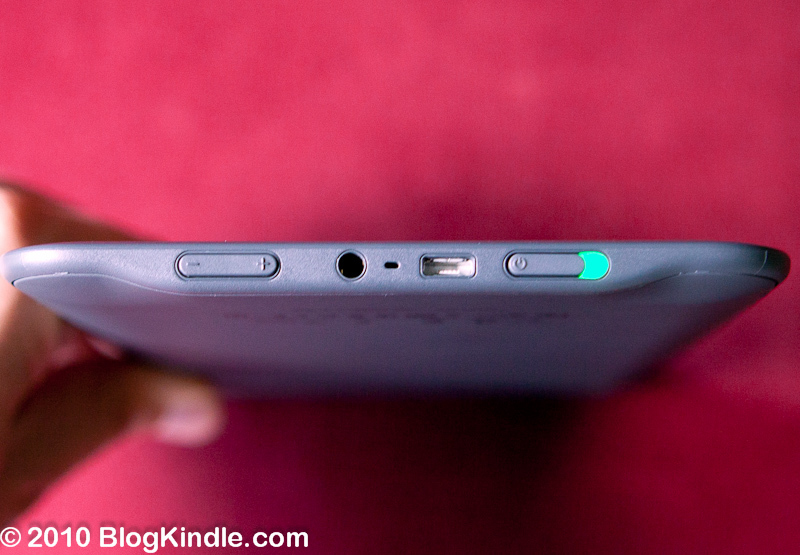 The light blinks green when Kindle 3 is turned on or off, glows orange when Kindle is charging and glows green when the device is completely charged. Witness 3 years of Kindle evolution. Kindle 1 released on the 19th of November 2007, Kindle 2 releaed on the 9th of February 2009 and finally Kindle 3 Graphite released recently. 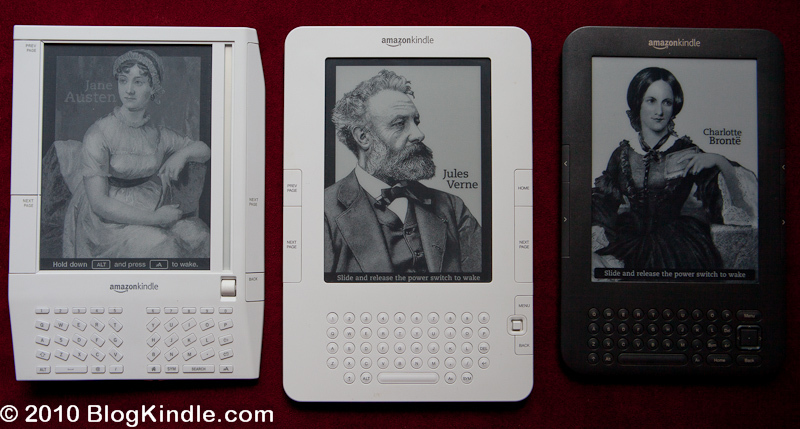 Notice the improving progression of screen contrast as eInk displays evolved over time. 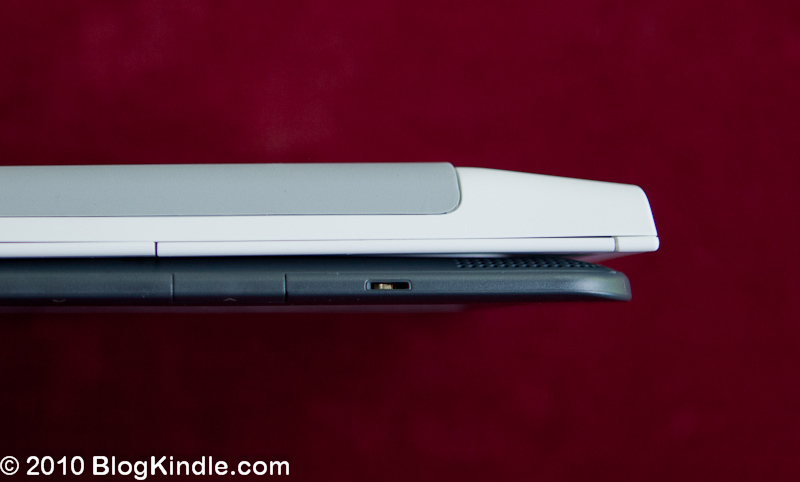 Although Kindle 3 and Kindle 1 have very similar footprint in the terms of thickness, Kindle 3 is almost 3 times thinner than the original first generation Kindle. Although K3 and K2 are almost indistinguishable by thickness (the difference is 1/50 inch), difference by footprint is considerable. As you can see Kindle 3 completely fits inside Kindle DX screen with still some room to spare. These are two different classes of devices. 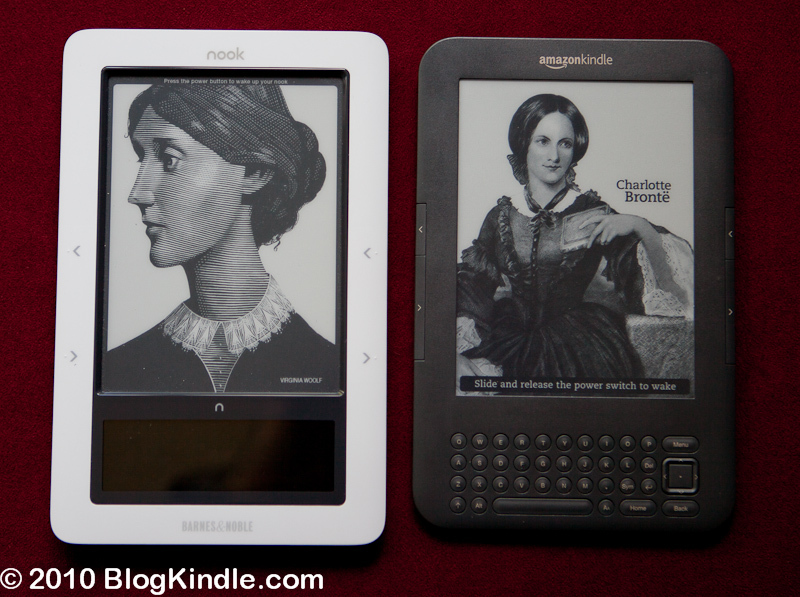 Kindle 3 is slightly smaller than Barnes & Noble Nook. It is also almost twice at thin and significantly lighter while packing same 3G + WiFi connectivity. In case of Kindle 3 however you can use free 3G Internet to browse any website rather than just download books. 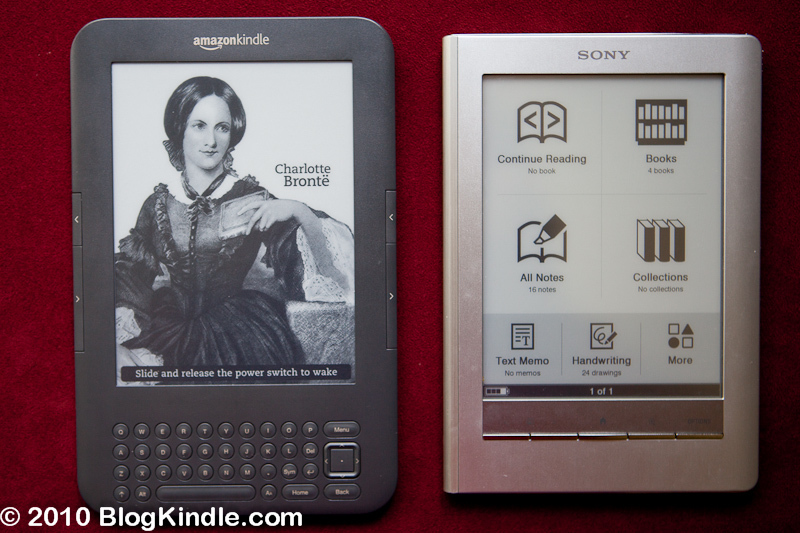 Kindle 3 has slightly larger footprint than Sony PRS-600 because of keyboard but is slightly thinner and considerably lighter. However the main difference is in display contrast. 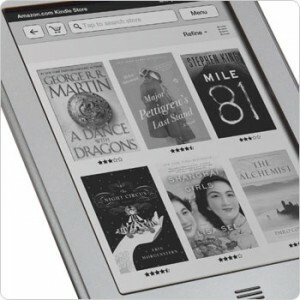 Kindle 3 Pearl eInk display contrast is almost 5 times higher than that of Sony. This difference has mostly to do with the touchscreen layer in PRS-600. Although these are completely different kinds of products I still photographed Kindle 3 and Apple iPad side-by-side just for the fun of it. Right now there are 220 customer reviews for Kindle 3. Of these 155 are completely positive five star reviews, 35 – positive four star reviews, 6 – neutral 3 star reviews, 7 – negative two star reviews and finally 17 – completely negative one star reviews. For the last several days ship date for Kindle 3 remained unchanged as “on or before September 17th”. BTW: I have plenty of hosting bandwidth so you are welcome to hotlink these pictures.